BATH & BODY. LUSH BLUE SKIES AND FLUFFY WHITE CLOUDS BUBBLE BAR. | Life Looks Perfect. BATH & BODY. 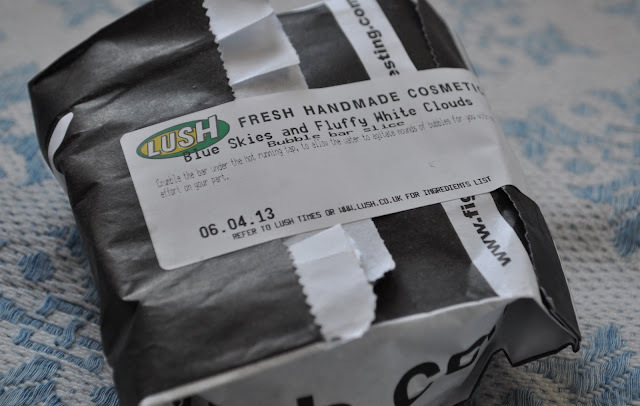 LUSH BLUE SKIES AND FLUFFY WHITE CLOUDS BUBBLE BAR. Mmmm picture blue skies and fluffy white clouds (not too many clouds but just enough to make out a few shapes of a dragon or a pineapple...you catch my drift hehe). Now you have the picture, imagine what that would smell like? Difficult, I know but lucky for us Lush cosmetics have taken it into their own hands and had a go! This is my very first experience with a famous Lush Cosmetics Bubble Bra (oops, sorry I actually thought it was hilarious that i just mistyped that so had to keep it in) - what I really meant to say is Bubble Bar. As I'm sure some of our readers will know, a trip to Lush always makes any dreary day a happy one. With a bubble bar, you just crumble some of the bar under the running tap to your bath and bubbles with start appearing. 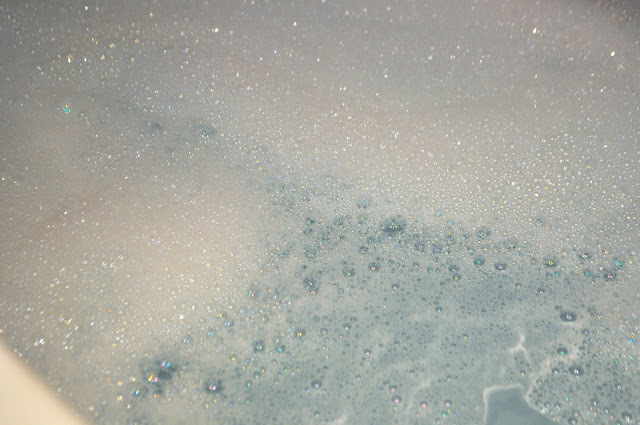 If you hadn't guessed it already, the bubbles looks like fluffy white clouds and the bar also turns the bath water a beautiful baby boy colour. Ultimate relaxation after a long day at work. With calming and earthy scents of patchouli and frankincense, Lush say that with this fragrance "you’ll always touch down with your mind grounded and centred". I love the scent as it calms me down instantly. It slightly reminds me of a few pillow sprays that I have tried, which is supposed to assist in a better and deep night sleep. A bath before bed with this baby is just as affective. Although this bar is one of Lush's more expensive bath products, it is worth every penny. The bar is absolutely huge and you would definitely get at least 4 to 5 uses out of it. The bar is very dense, most likely due to the mix of two layers to make the swirling design, so be warned when trying to brake it up. I actually had to take a knife to it, in order to brake it! I love the bubble bar as it not only smells fab, it also softens your skin too. Although this product may seem simple in comparison to some of Lush's other bath products (got the Dragon Ball bath Bomb in mind- exploding everywhere hehe) it is normally the simple things that I love best. 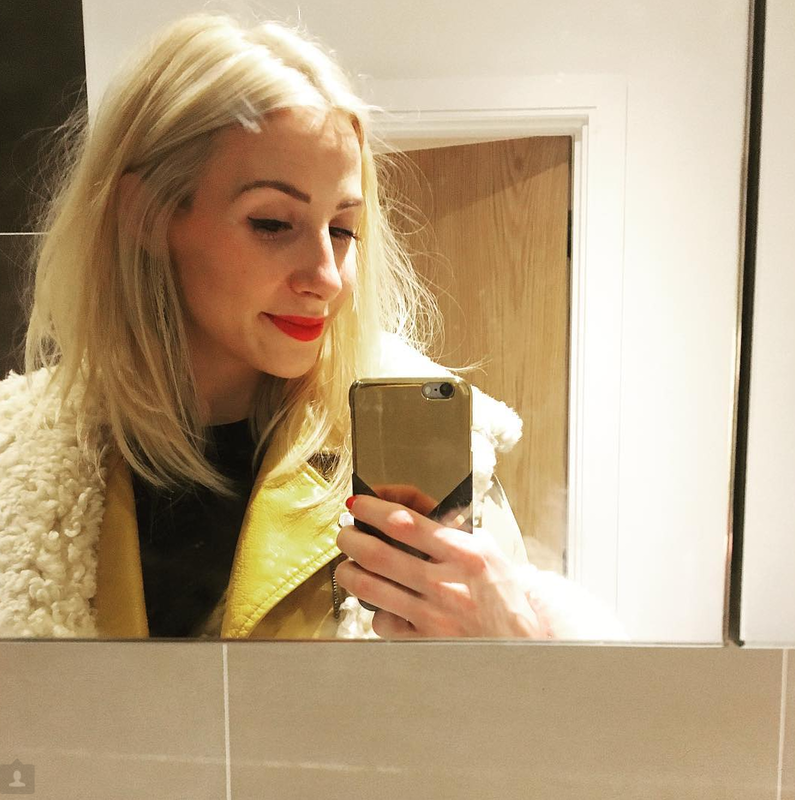 When Jess and I were writing the review for the fab Lush Brazen Honey Face Mask, we feel in love with Lush's YouTube videos, as they actually show you how each one of their products are made! It's so interesting to know the processes and how they do it! 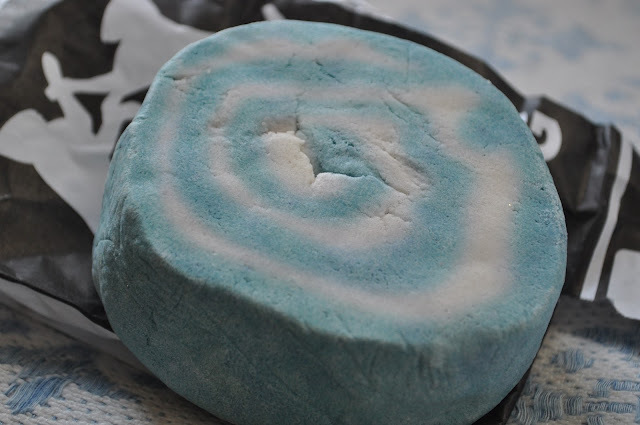 As you will see, this bubble bar is made like a giant Swiss Roll!